Born to captivate, Betta Splendens known as the Siamese fighting fish is one of Thailand’s iconic species. As colorful as its rainbow-hued fins, this Siamese fighting fish has a history just as vibrant. Affectionately coined as the ‘Jewel of the Orient’, the betta species is appreciated for their gorgeous appearance displayed particularly when their fighting instinct comes to life. The only place that reminds the world of the betta’s beauty is the Siamese Fighting Fish Gallery situated on the Bangkachao Peninsula in Thailand. A learning center for the general public, this Gallery plays an important role in conserving the knowledge and legacy of the fighting fish species today. However, the Gallery has seen a declining rate of visitors in recent years, both due to the decreasing interest for the fighting fish among the local young audience, as well as the reduced number of tourist visitors resulting in the lack of funds for continuous conservation and improvement of Fighting fish species. Optimum Betta, the fighting fish food brand who has been with Siamese fighting fishes for a long time best known for betta color enhancement and good health in cooperation with Shutterstock Thailand, a global marketplace for inspirational pictures and VDOs create this project aiming to turn this around. Interests in the fighting fish amongst young generation needs to be re-ignited to create talkability, drive the Gallery’s traffic and let the world witness various beauty and information of each spicy of the fighting fishes. To trigger appeal, we needed to connect with the audience with an evolving approach that makes the Siamese Fighting Fish relevant and engaging again. 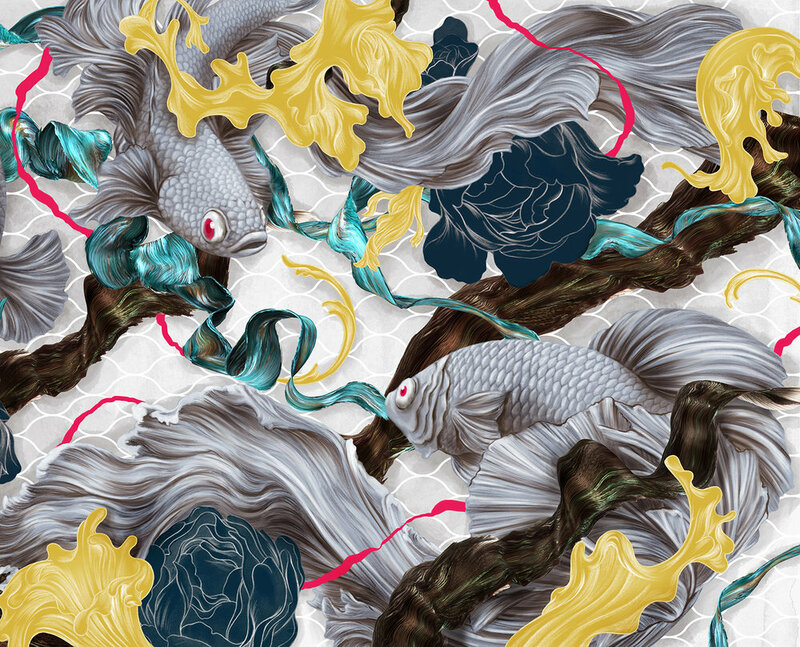 Inspired by the brilliant coloration, long and elegant flowing fins of the fighting fishes displayed at Siamese Fighting Fish Gallery, we utilize advanced creative technologies to transform their unique beauty of the Siamese Fighting Fish into art pieces. We use “Motion Analysis”, “Pigment Extraction” and “Digital Trail Sculpture”. These visualization techniques allow long exposure to beautifully capture the dynamic movements of the fish, visualizing unpredictable yet astonishing art patterns. 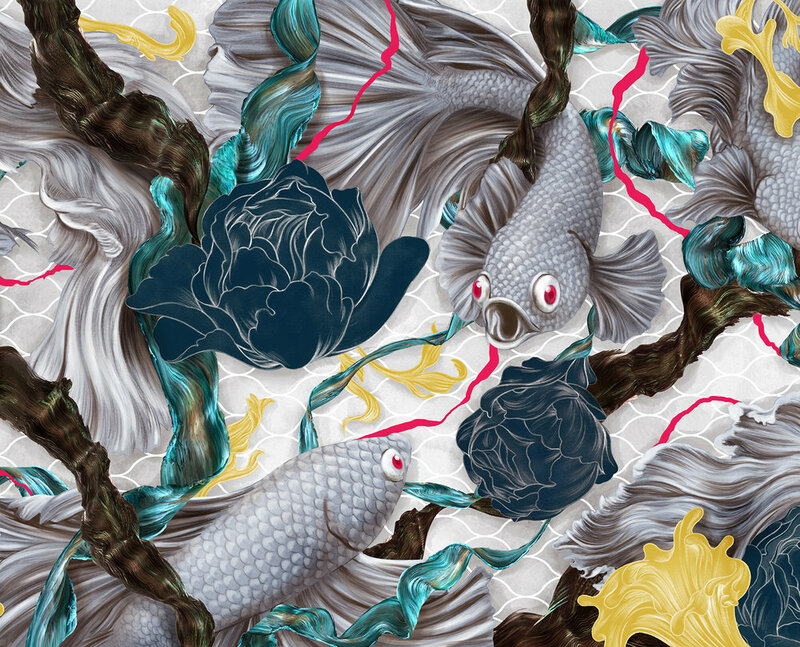 "ART OF THE SIAMESE FIGHTING FISH"
Optimum Betta, a fighting fish food brand joined hands with Shutterstock Thailand, a global marketplace for inspirational pictures and VDOs to produce the campaign "ART OF THE SIAMESE FIGHTING FISH," that brings to life the art patterns from the movement and brilliant colors of the fighting fish species. Google Image "Siamese Fighting Fish"
Shutter Stock "Art of the Siamese Fighting Fish"